Trine 2: Director's Cut, a launch Wii U eShop release back in November 2012, remains one of the best-selling download-only titles on the store, while Trine Enchanted Edition was a recent release. The presence of those two games, and the fact they run rather well, has given us cautious optimism that Frozenbyte's recently announced Trine 3: The Artifacts of Power could find its way to Nintendo's home console. At present the 2015 release is confirmed for PC and 'consoles', with no further specifics as yet. Frozenbyte has shown an admirable commitment to quality in its Wii U releases to date, even if the Nintendo system had to wait a little longer (for Enchanted Edition) while other releases were finalised. With the fresh title boasting more beautiful visuals and incorporating full 3D gameplay for the first time in the series, it would certainly be a welcome arrival on the eShop. Time will tell whether the Wii U will join - seemingly inevitable - PS4 and Xbox One versions, but in the meantime we can admire the project's progress with some optimism. First-look gameplay footage below (via IGN) looks pretty strong - this PC gameplay shows a solid (at times delightful) shift to 3D play. I can see them easily brining a Wii U version after they said they were happy with sales and brought Trine 1 to it as well. I became a big fan of the series because of the Wii U games, I really hope this lands on my home console of choice. I don't see any reason why this won't come to the Wii U. As I understand it, sales of the previous Trine games sold better on the Nintendo system than Sony or Microsoft. It's beautiful. I hope it comes to the Wii U! 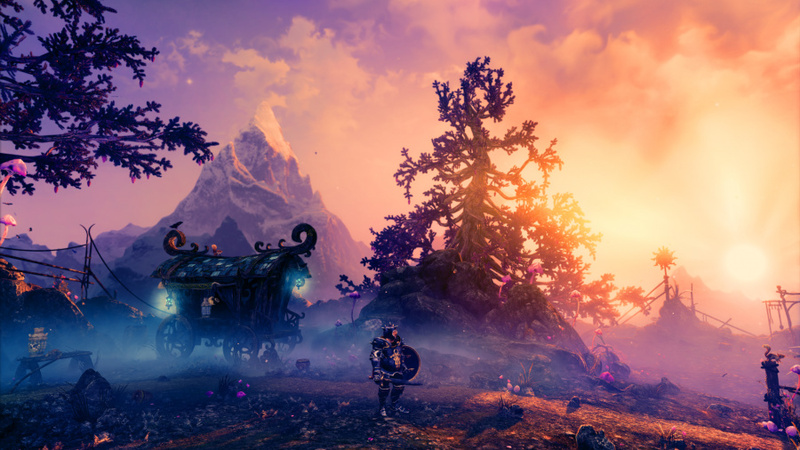 Looks really great, it seems that Trine 2 did pretty well on Wii U so I'm hopeful it'll be coming. It's funny how many games are reported on here with a "MAYBE it'll come to Wii U!" 3D gameplay could certainly be what makes me try this series again, after not really falling in love with Trine 2. Fingers crossed for a Wii U version. I don't really see anything in these videos the WiiU couldn't handle. But for the love of God, please let me change the controls on the WiiU version. The choice for attacking on ZR instead of regular R is TERRIBLE! I can reconfigure the controls how I see fit on the PC version, why not the WiiU? I think it's likely to get a Wii U version. Maybe not at launch, though. I wouldn't worry too much. This is one of the few multiplatform titles that seems to do well on Nintendo consoles. "Fingers still crossed for a Wii U version"
What @ikki5 and almost everyone else said, why not? Wii U is running XCX, should be able to handle this, or most anything else really as I can only think of 1 big game coming to "next next" gen but not PS3 or Xbox360, and that's Batman. Power isn't Wii U's problem, it's sales, and this should do well enough. I hope. So it's still a linear 2D game but much wider, sort of how like LBP3 went from 3 to 16 layers. Clever. Still looks great too. May be Day 1. Anybody else think that strange floating crate was broken game design before noticing it was attached to a rope? Looks pretty good. As for why it might not technically be able to be on the Wii U, this is PC, XB1, and PS4 level of polygons and effects, not Wii U level. Keep in mind this is the PC build. It won't even look that good on the XB1 and PS4. It's possible it scales well and it could be greatly diminished in order to preform on Wii U, but yikes. I agree that the success of Trine could mean they are still targeting Wii U and I, of course, hope they do. I do like how this series makes use of the forced camera perspective to really flesh out the environments with more details than other games, but the game play has often left me annoyed at times. Have to admit the new freedom of movement has me intrigued but then I think of the mushy controls now applying to 3D space. I'm a bit skeptical. The nice thing is that it has segments of platforming that switch to side view for the more precise actions similar to how Other M approached things (that part was a good approach not arguing anything else like the d-pad or content here!). I think that's a solid way to make a game if done carefully. I always think of Metroid when I play these games, too. It's the world and the details. When I think of a 2D metroid with 3D graphics I imagine the visuals of the Trine series... but solid controls please and naturally all the other metroid trappings. This reminds me of mid-90ies 3D platforming actually. It seems very well made...... I LIKE! Wow that gets me hyped for this for sure. One of my favorite indie franchises. It's called Artifacts of Power and has little golden triangle shards. And the video showcases a dude with sword and shield running around swinging his sword like a madman. Even if they have to tone down the graphics quality by a ton, how can this NOT be on Wii U? Also Bloodbourne (oh wait, already out), Final Fantasy 15, Deep Down, Witcher 3, Battlefront 3 and other games I can't remember at the moment. None of those would be able to run on Wii U without ridiculously huge drops in quality. Power is a problem with Wii U. Xenoblade Chronicles X has huge scale, but most other Wii U games with smaller scale don't look any better than that game anyway (once you get past the scale, XCX isn't all that impressive as the individual elements are just average 7th gen-level quality). Even so, this game would probably be able to run on Wii U once they drop character model quality and shader quality. It looks great. The controls are spongy in Trine 2, and that looks like it will be the case here judging by the jumps into the wall. As far as I'm concerned, this is a must buy no matter what systems it arrives on. [EDIT] Corrected Ground Zeroes to Phantom Pain. @FLUX_CAPACITOR One thing to take into account is the advanced lighting, shadow, and particle effects. Not to mention rendering a few large items, such as in Mario Kart8, is easier than rendering many smaller items, like Diablo III, which ran poorly on Xbone/PS4 until a patch. Speaking of Mario Kart, Nintendo has a way of programing for their own hardware in a way third parties, especially indies, are not as successful with. I would expect Frozenbyte will be able to run this game on Wii U with scaled down resolution and shaders/effects. Well, this is the problem with the diminishing returns of graphics tech improvements. It's hard for the average person to distinguish the differences. Mario Kart 8 does a great job with what it has but go into slo-mo and just look carefully at the environment. It's colorful, inventive, wonderfully shaded and fun but it contains a fraction of the on-screen polygons demonstrated in this game and some textures are lower resolution than you might have realized during game play. Shading tricks have hidden a lot of this in games and if you can't tell, it's all the better for you while playing, but the environments in this are relying on a higher polygon count, very high resolution textures and heavy use of shaders that seem pretty far beyond the capabilities of the Wii U. If it comes out for Wii U and you can't tell the difference between that version and the one in video here that's great for you, but I'm betting I'll be able to tell. If I can't you can call me out on it and I'll be incredibly impressed. I love how he vows to find the farmer's sheep (yay!) and then the first thing he does is completely wreck the farm (huh?). I loved Trine 2 on Wii U and I am not really sure if I would buy it if it was released for the other systems seeing as I typically play indie games almost exclusively on Nintendo systems. The games are a good fit for Nintendo consoles and I can't say I would really be willing to play them on anything else. @AVahne - Yes, some of the next next gen games wouldn't run on Wii U, but power isn't the reason Wii U didn't get Madden or COD or Destiny or GTAV or any of those other games that were also released on PS3 and Xbox360 b/c the Wii U can do what those old systems can. Power wasn't the problem w/ those multigenerational games. And there are/were more of those last year than next next gen only. MGSV is also releasing on PS3 and Xbox360 so I'd bet Wii U could run it if given the chance w/o huge drops in quality. I did forget FFXV, but that probably won't release in 2015 either. Witcher 3 does belong aside Batman as next next gen.
Looks great and its likely to hit the Wii u. If not we've got serious problems as I believe trine 2 is one of the very top selling e shop games to date!! Given the Wii U version(s) options of sticks, pointer, or touchscreen, I have no interest being restricted to analog sticks in Trine 3... So if it doesn't come to Wii U, I'm not sure there is much appeal to me and my friends. Trine 2 was pretty cool, and from what I have heard, it sold pretty well on Wii U. There is no reason to believe this won't come to the Wii U at some point. It will just take a liitle longer to port it over so they can get it running smoothly. Trine 2 ran incredibly well, so I know the developers can be trusted to make the Wii U version just as polished as any other version. I'm willing to wait for quality. I wasn't aware Wii U was capable of tessellation displacement. That could help with the perception of intricate geometry which does temper my argument quite a bit. I'm still seeing a large gulf here, however, and I was only using Mario Kart as a comparison because you brought it up as an example to compare to. They aren't very comparable as you are pointing out. My point was more about perception. Things look a little better in Mario Kart because you don't have time to study them. In this game, as you've pointed out, it is slow moving and everything holds up amazingly under scrutiny. I noted the advantages of the (somewhat) forced perspective format in an earlier post, too. It's what helps Trine 2 accomplish what it does. A better comparison might be Trine 2? This game is far, far more demanding from what I see. It would be remarkable enough to see it in 1080p, like this demo, as the more simple in comparison Trine 2 was 720p. Incidentally, I've programmed for 25 years and developed games for multiple platforms myself. Doesn't really give me much credit for noticing these things, however. If I was a graphics engine programmer (which I've only dabbled with here and there) it might mean something. I'm surprised you aren't seeing the disparity I am though. I'd prefer to have all the Trine games on the same system so hopefully it will get a Wii U release. Really enjoyed the first 2. They've really upped their game this time around in regards to composition of good pictures. Much prettier game overall than the first two! And this time there's Z-axis movement! This one looks amazing. I will gladly buy this on the Wii U!